Building the 2011 Cleveland Indians: Who are these guys? Fausto Carmona was signed as an undrafted free agent in 2000. Scouts in GM Mark Shapiro’s early years liked what they saw in this young pitcher, and were able to get him after the 50-round draft. Carmona is the longest-tenured Indian, and has had many ups and downs throughout his career. However, baseball fans know the potential the 27-year-old pitcher has after his 19-8 3.06 ERA in 2007. The next acquisition was Hafner, who the Indians received in a trade to the Texas Rangers for veteran Catcher Einar Diaz in 2002. Despite injuries, Hafner has exceeded the production of his trade counterpart. When healthy, Hafner is one of the more productive DHs in the American League. Hafner lead the league in many hitting categories and has finished in the top-five of the MVP race. Hafner and Sizemore will be the keys to success in the 2011 Tribe. Sizemore was received in a trade along with Phillips and Lee for Colon from the Montreal Expos in 2002. In all reality, this may be the best trade of the decade. An under-producing, big-name starting pitcher with an expiring contract was traded to a broken franchise for three minor leaguers. These three players have gone on to eight All-Star games, four Gold Gloves and a Cy Young Award since they debuted for the Tribe in 2003. Sizemore, like Hafner, has recently battled injuries, yet he’s the definition of a five-tool player, with his speed, power, fielding, average and throwing. Twenty doubles, 20 HR, a Gold Glove, and 20 SBs are common for this great 28-year-old center fielder. Josh Tomlin, who is having a sensational start to the 2011 season, was acquired in the second wave of young infusion to this current Tribe. Tomlin’s 11-4 start to the season includes an impressive streak of more than five IP in all 31 of his major league starts. He was heavily scouted by the Padres in 2005 when they drafted Tomlin in the 11th round. Luckily for the Cleveland Indians, Tomlin did not sign, and was drafted the next year in the 19th round by the Tribe. The 26 year old starter is in his first full year, and looks like a promising starter for years to come. Asdrubal Cabrera has been the Tribe’s MVP during the 2011 campaign. Acquired from the Seattle Mariners in 2006, Cabrera has continuously improved to become an All-Star starter this season. Cabrera was traded to the Indians for a struggling veteran with an expiring contract, also known as Eduardo Perez. Before we discuss the impact Cabrera has had on the Tribe lets first congratulate Shapiro for trading a player who was of little use, besides teaching professionalism for the development project Indians to the Seattle Mariners, a team struggling to stay relevant, and snatching this prize winning short stop. Now, back to Cabrera. A .300 hitter with over 15 HR at the All-Star break, he deservedly was given the opportunity to start the All-Star game after the legendary Derek Jeter declined the invitation citing exhaustion. At 26, Cabrera is an essential part to the present and future of the Indians. His skills and love for the game make him a fan favorite and a player to build a team around. Cabrera is not the only building block the Indians received from Seattle in 2006. That summer, the Indians also acquired Shin-Soo Choo from the Mariners, in exchange for promising power hitter Ben Broussard. The potential for Choo and Broussard at the time of the trade was equal making this a fair trade. Both young players, with different skill sets, had the potential to be everyday starters. In the years that followed, Choo proved to be the better player. Showing flashes of being a five-tool player, Choo has excelled with his fielding and ability to throw runners out from right field. His batting average has been consistently above average, and has shown flashes of power. Broussard never learned how to hit a curve ball. Enough said, Choo and Cabrera, both 26, were key additions to the Tribe. The third infusion of young talent to the Tribe started in 2008 with the first-round draft pick, Lonnie Chisenhall. With the 29th overall pick in the draft, the Indians believed they landed their future third baseman. Andy Marte, the Tribe’s first attempt at raising a third baseman was starting to become a glaring hole. Marte struggled with every facet of the game and could never get it going. In comes Chisenhall, who was called up from triple-A Columbus on June 28 and has been the starter at third since. Hitting .227 through 13 games, Chisenhall has been clutch and surprisingly consistent, despite injury and reaching base in 10 of 13 games. Chisenhall seems to be growing into a solid third baseman, and his productivity is on the rise. When the trade deadline arrived in the 2008 season, the struggling Cleveland Indians had valuable assets. Casey Blake, despite having a career year on a struggling team, was a blessing in disguise as he was heavily pursued by the contending Los Angeles Dodgers for top-prospect catcher Carlos Santana. At the time, the deal was confusing considering the Tribe had an All-Star catcher in Victor Martinez. However, the front office had a plan bigger than the 2008 season. 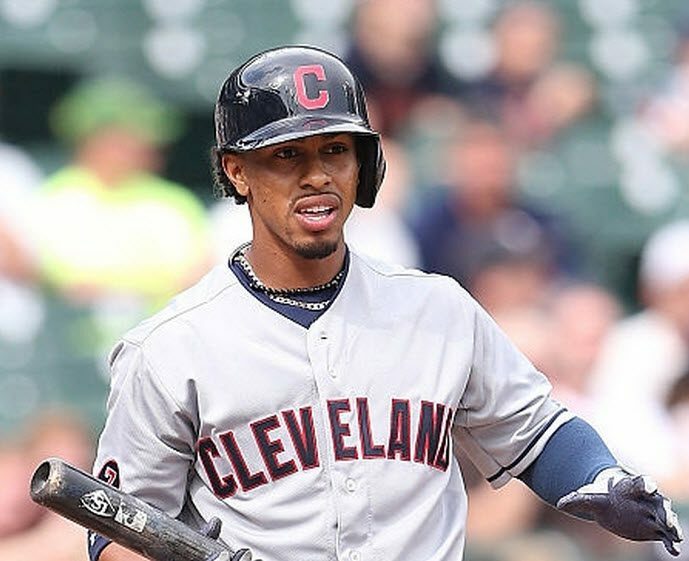 Santana has been hitting in the 3-4-5 position most of the season because of Injuries to Hafner and Sizemore. Hitting .231, Santana has contributed power numbers, while Hafner battles injury, delivering 15 HRs and 45 RBIs. The biggest asset the Tribe had to offer to the contenders in the 2008 trade deadline was reigning Cy Young Award winner CC Sabathia. The Indians searched for the best offer, and jumped at the opportunity to get two of the top three prospects from the Milwaukee Brewers: Quick, productive, quality-fielding center-fielder Michael Brantley and power-hitting first baseman Matt LaPorta. In trading Sabathia, it was the clear the Indians were ready to move on from their recent ALCS appearance. Losing popularity, Shapiro and his staff knew Sabathia would not re-sign in the summer, and found the best trade partner in the Brewers. Brantley is hitting .276 with occasional power and clutch RBIs. He is also an excellent base runner, scoring 51 runs. LaPorta has yet to fully hit his stride, but has managed to stay productive, and is a key part of the lineup. LaPorta is scheduled to bat in the six or seven spot, but has gotten valuable experience at the top of the order because of injuries. Knowing the Tribe would be unable to re-sign Sabathia, the Indians received two everyday starters making this a quality trade. The 2009 trade deadline was similar to the previous year, again with top-level assets available. In three trades during the month of July, Cleveland acquired two top-of-the-rotation starters and a closer, all under the age of 26. A different approach to last year’s influx of young position players. Justin Masterson, Carlos Carrasco and Chris Perez have been additions to the Tribe, and are producing early and often. Masterson, acquired from the Boston Red Sox for Victor Martinez, is 8-6 with a 2.80 ERA as the Indians number-one pitcher. Carrasco has the most pressure to perform, as he was the prize asset in the Lee trade with the Philadelphia Phillies. Carrasco is 8-7 with a 4.25 ERA. He has been consistent, and keeps the team in games while showing flashes of dominance. The final piece to the pitching fury was acquiring All-Star closer Chris Perez from the St. Louis Cardinals, who was swapped for second baseman Mark DeRosa. Perez’ season consists of 22 saves, a 2.36 ERA and an All-Star appearance. Two deadlines completed decently. The last two trade deadlines brought in an everyday catcher, first baseman, outfielder, two starting pitchers and a closer, all under the age of 26. This group mixed with the other acquisitions, make it clear that the Tribe is set, and ready to contend. An under-noted fact is the ability Shapiro had in signing veteran free agents who became valuable trade assets in lost seasons. Along with the front office making trades and scouting well, the front office hired a great staff starting with Eric Wedge, a great teacher of the game for these young players, and then recently hired manager Manny Acta, a professional, personally making the Tribe believe in their talent. Not willing to pay top of the market prices for these quality players, the Indians relentless positive action built a team for the future, and as a result, these moves are paying dividends.